Make sure you are using branded business cards, stationary, etc. with your photo included. Do a monthly mailing to at least 50 people (or however many you have in your database. Don’t have a database? That’s a “must have for any successful REALTOR. Set a goal of meeting at least 5 new people very week and add them to your database mailing list. Being active in your community will help in accomplishing this task. Send weekly market status reports to your sellers each week. Followup with a phone call to discuss the report. Impressing your seller with followup will gain referrals for you. Make sure you are educating yourself. While this is not directly a marketing idea, you will pick up ideas as you spend time learning and being around others that are being trained. Some places you can receive training include local Board seminars and meetings, Board sponsored educational seminars, continuing education classes, and office sponsored educational classes. If your brokerage doesn’t offer classes, you are welcome to attend ours. CLICK HERE to contact us for a class schedule. Set up an email distribution list to other REALTOR contacts in your area to market listings. When you have a good transaction with an agent, add them to your list. People like to do business with people that they know. Develop a dynamite pre-list packet and have your broker preview it before using. If you need help with this, CLICK HERE and let us know. Have a personal logo developed that depicts who you are. Develop your own personal brand. Remember, it is usually better to be a specialist than a generalist. Broadcast your client’s move. By providing resources to your clients to let their friends, family and acquaintances know about their move, you will be generating referrals for yourself. If you need help with how to set this up, let us know by CLICKING HERE. Do open houses. I just wrote a blog posting with a checklist of how to make open houses count. This is a great way to gain exposure for your listings and meet potential buyers and sellers face to face. Use Realty World Sweepstakes flyers to obtain registration information at your open houses. 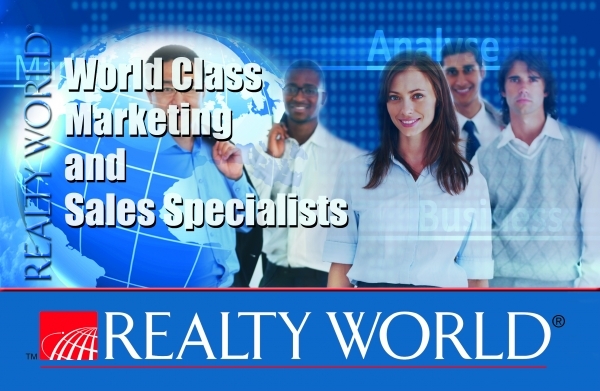 Not a Realty World member? We can help you with that! Just CLICK HERE and set up a meeting with us. COOP market with other merchants. For instance you could work with a local ice cream parlor to send gift certificates to your clients for their kid’s birthdays. The local vendor will bill you when the certificate is redeemed. Get involved with at least 3 community networking groups. For instance, the local Chamber of Commerce, Kiwanis Club or Rotary Club would be a good place to start. There are also Women’s Clubs, Veterans Organizations and Tip Clubs that might be a fit for you. Do a monthly mailing campaign to your Sphere of Influence or farm with market updates. You can pull the stats directly from the BLC. You might consider using the US Post Office’s “Every Door Direct” services for your farm area. By the way, never place any material without postage in your farm’s mailbox. That’s inviting a fine (per piece) from the Postal Service.